Whether you are a fan of fine arts or not, Da Vinci Diamonds Dual Play Slot is worth a try! It is an IGT creation coming with 2 sets of Tumbling Reels and 40 paylines. Rediscover the exquisite paintings of Leonardo Da Vinci while you admire brightly coloured gems on the reels. The various symbols you can find on the reels are the Mona Lisa, Da Vinci Diamonds Logo, Portrait of a Musician, Lady with an Emine, Yellow Gem, Red Gem and Green Gem. This brilliant game can be launched on a PC, mobile phone or tablet at Wicked Jackpots. Start by picking one of the bet values available on the Line Bet display of Da Vinci Diamonds Dual Play Slot. Set all your preferences and press the Spin button to activate the reels. Notice how the symbols tumble from above instead of spinning, which is very rewarding. Also, make use of the Auto Spin tab to enjoy 10, 20, 30, 40 and 50 rounds which are played hands-free. Bet Levels: Bet levels are not available on this slot. Amount of Paylines Selection: All 40 lines are active and cannot be adjusted. Coin Values: Select one of the following line bets: 1.00, 2.00, 3.00, 5.00, 10.00, 20.00 and 25.00 credits. 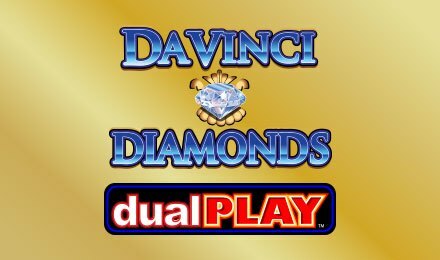 Look out for the Wild icon on Da Vinci Diamonds Dual Play Slot! It substitutes for all symbols to form a winning combination, except for Extra Paylines Bonus. The main attraction of this game is the Tumbling Reels feature. It is activated with any winning combination. It is also very lucrative as the symbols that are part of a winning combo disappear to allow for others to fall in their place. It means that more winning combinations can be formed on the reels. Another plus on Da Vinci Diamonds Dual Play Slot is the Tumble Thru Feature, whereby symbols tumble from above to take the place of unused ones on the bottom reels. With at least 3 Extra Paylines Bonus icons on reels 1, 2 and 3, the Free Spins round becomes active. Receive 6 free spins and play along with 20 extra paylines being added. The round thus uses 60 paylines! When 3 Extra Paylines Bonus symbols appear on reels 1, 2 and 3 during the feature, you can earn 6 additional free spins. Up to 300 spins can be retriggered. Admire beautiful paintings and colourful gems as you spin the reels of Da Vinci Diamonds Dual Play Slot at Wicked Jackpots.